Former Makati mayor Junjun Binay and his sister, incumbent Mayor Abigail Binay, have exchanged a few words over who among them should run for mayor in 2019. Both seem determined to run, but none of them, it seems, want to do so for the right reasons. Junjun Binay, mayor of Makati between 2013 and 2015 when he was suspended over a graft case, said 13 out of 16 Makati councillors and 80 percent of barangay officials had withdrawn their support from Abby, and pledged support for him, requesting that he run again. He said his sister should run for Congress instead, since she has been a congresswoman before, and could easily retake her seat. He said residents of Makati have missed “the Binay brand” of governance since he was gone, and if Abby runs against him, it will not be Binay versus Binay but Binay versus Campos, his sister’s married name. Abby bristled at what she deemed a sexist comment, saying she was born a Binay and she would die one. She added that their father, former vice president Jejomar Binay, had already decided that she, not Junjun, would run to be Mayor of Makati, the country’s financial center. She said she already had the endorsement of her father’s UNA party, and that the former vice president would run for Congress under the same banner. 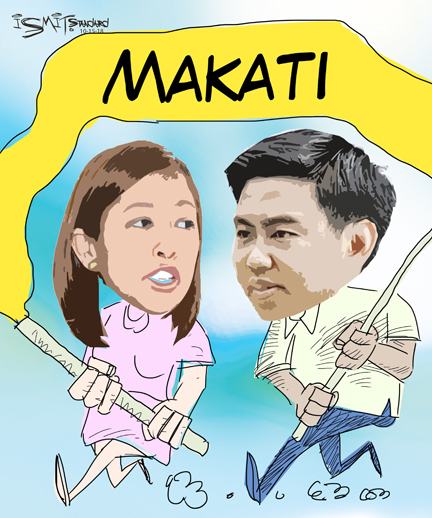 Abby said Junjun could run under another party, but she would win anyway because Makati voters trusted her. She also confirmed that she and Junjun haven’t talked to each other since he invited Makati politicians and officials to his birthday on July 12 and snubbed her. We hope the Binay siblings find a way to resolve their conflict, whether or not their father mediates. The people of Makati, whom the Binays say they want to serve, expect no less than genuine leadership, statesmanship and humility from those they vote into office.